William P. Suitor joined Bell Aerosystems as a rocketbelt test pilot in 1964 and has flown over 1200 flights without serious injury. Suitor, was hired by Bell to prove to the United States Army that an average, draft-age GI could fly a rocketbelt with little or no previous flight training. Bell Aerosystems was responding to a solicitation from the Army’s Transportation Command in Fort Eustis, Virginia for a unique device known as the SRLD or Small Rocket Lift Device to be used by specialized troops. The device was envisioned as a tactical/rescue vehicle with one main requirement, being ease of use and training. Wendell F. Moore, the lead engineer and the inventor of Bell Aerosystems’ SRLD considered Suitor a perfect choice. 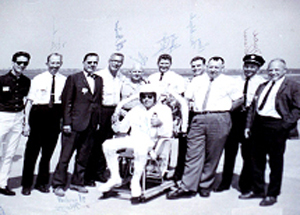 Bill Suitor flew as an official member of the well-known Bell Aerosystems Rocketbelt Flying Team from 1964-69 and demonstrated it's unique flying characteristics in over 13 countries worldwide. In order to develop this new generation rocketbelt, Amarenaformed Thunderbolt Aerosystems, Inc. in 1997 with the financial help of two partners. The company’s mission is to design and manufacture personal flight machines for entertainment, pleasure and rescue purposes. Its first model was dubbed ThunderPack®-R1G2 (Revision-1; Generation-2) was sold in 2003 to a large corporation in the far east, with intentions to use the R1G2 for rescue purposes. Suitor's distinctions also include working on the Apollo Lunar Program, testing different variations of the rocketbelt that were being considered for use by NASA's Apollo Astronauts. One of these devices known as the L.E.A.P. or Lunar Escape Astronaut Pogo was designed to provide lunar astronauts with a means of leaving the surface of the moon should the Bell designed rocket ascent engine fail on the Lunar Module. 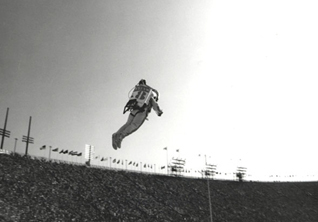 Following his career with Bell Aerosystems in 1969, Suitor joined the American Screen Actors Guild and began to fly the Tyler (based on Bell’s rocketpack made by California inventor Nelson Tyler) rocketbelt for television and motion pictures. Some of his credits include: "Thunderball" the James Bond thriller starring Sean Connery, "Lost in Space", "Gilligan’s Island", "The Fall Guy", “The Six Million Dollar Man”, “The A-Team”, “Newhart” and many other guest spots and commercials. the 1984 Olympics in Los Angeles, California. His most spectacular flight was at the Los Angeles 1984 Olympic Games where Suitor demonstrated "flight without wings" in front of a worldwide audience of two billion people. Later in early 1995, Suitor flew the maiden only flight of a rocketbelt (designed from Bell Aerospace patents) manufactured by American Rocket Belt of Houston, TX. Suitor holds all records of altitude, distance and speed for the rocketbelt and has been recently recognized for his achievements and contributions by the Society of Experimental Test Pilots. In 1997 Bill Suitor was contacted by Carmelo “Nino” Amarena chief designer at Thunderbolt Aerosystems in California, and asked him to be the official test pilot for their new generation rocketbelt dubbed ”ThunderPack”, being readied to fly in the fall of 2001. Suitor tested the first revision of this second generation (TP-R1G2) rocketbelt successfully. The lessons learned with these designed engineering tests, led the development of a second revision of the ThunderPack with many of Suitor’s design changes suggestions. He is currently retired from his employment at the New York State Power Authority and lives in Youngstown, New York with his wife Cheryl. He has recently written an autobiography of his many experiences as one of the ‘original’ rocketmen.